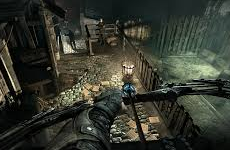 Thief is a reboot to the original Thief series. You probably don't remember it though since the last game in the series was released almost 10 years ago for Xbox and PC. This game is basically Assassin's Creed in first person with a greater emphasis on stealth. If you enjoyed the sneakiness of Splinter Cell, there's a good chance you will like this game. From the trailer I believe this game will follow in the footsteps of the series and allow you to switch between first- and third-person.